Visitors come from far and wide to behold the majestic sites of Denali. Located in central Alaska, Denali is the definition of remote, but getting there is no problem. Take a flight to Talkeetna, or drive from Anchorage. Once inside the park, bus and plane tours are available. Be sure to see the abundant glaciers including Kahiltna Glacier, the park’s longest. Explore the lush forests including the deciduous taiga, coniferous mountain forests full of moose and deer, and pay homage to the tundra, home to large herds of caribou. 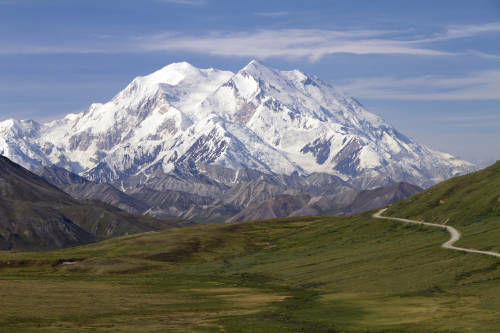 Denali is a mountain climber's delight, and guided tours up McKinley are available. These are not for the faint of heart and require planning, training, and skill. Deaths occur regularly. For a less deadly adventure try backpacking on any of the hundreds of miles of trails, or try dog sledding, snow machining, or cross-country skiing in the winter. The Denali Park Road offers amazing views of the Alaska Range, but only the first 15 miles are open to private vehicles. After that, you’ll have to arrange to be on a tour bus. Denali Backcountry Lodge is an exclusive lodge located in the enclave of Kantishna, an oasis of private land deep inside the boundaries of Denali National Park. This is an all-inclusive vacation with meals, activities, and rentals! Perched on the banks of the Nenana River, the Denali Park Village is just across the river from Denali National Park.